The humble jar of honey in your cabinet is more than just an exquisite sweetener -- it's also an incredible survival food and medicine chest rolled into one. Known throughout history for its health merits, honey is a broad spectrum healer. Heart disease, high cholesterol, influenza, wounds and infections respond well to this common and seemingly simple golden liquid. Since certain types of honey are more effective than others, choose wisely to enjoy the maximum benefit. Honey is one of the most outstanding survival foods that can stock a pantry. When stored in an airtight container and kept cool and dry, the shelf life of honey is remarkable -- it does not turn rancid, ever. In fact, archeologists have found jars of honey in ancient Egyptian tombs that are still fit for human consumption. When selecting honey, it is important to focus on raw, organic and unfiltered varieties for the most bioactive properties. Once honey is heated, many of the health promoting characteristics disappear. Nutrient dense, honey is packed with probiotics, antioxidants, vitamins and minerals. It is also calorie rich and helps to maintain energy levels. High in B vitamins along with vitamin C, honey is also a good source of magnesium, calcium, copper, iron, sulfur and zinc. Honey helps to boost athletic performance and supports a healthy immune system as well. For those with Type II diabetes or high cholesterol, honey is a good choice. Scientists found that when taken daily, honey actually lowered serum cholesterol and did not spike blood sugar levels like refined sugar. A word of caution: Babies under the age of one year should not be given honey due to the threat of infantile botulism. When times are tough and medical care is erratic, manuka honey is a readily available universal medicine. Considered to be five times more potent than standard honey, manuka is a powerful food. Have a cut or burn to mend? Manuka honey is an excellent salve. Antibacterial features promote wound healing and tissue regeneration. Manuka is also anti-fungal -- a potent treatment for ring worm and athletes foot. Likewise, many claim that manuka honey does not inflame internal fungal disorders like Candida albicans. Gum disease? Surprisingly, research has found that manuka reduces plaque and bacteria in the mouth when rubbed onto the gums. Sick with the flu? Manuka is a superstar here too. A study in Spain discovered compounds in honey that destroy the influenza virus. What's more, manuka has been shown to aid weight loss, heal bladder infections, ease indigestion, soothe a sore throat, relieve arthritis, quiet an upset stomach and foster longevity. No need to wait for the collapse of civilization or an economic meltdown to enjoy the benefits of this rich liquid gold. With an abundance of healing properties, honey is a delicious medicine that encourages a sweet and healthful life at any time. Sweet post! Thanks for all the great information and links on a subject I have been meaning to research for a while. Excellent. Great to hear the information was helpful. Have a terrific week! 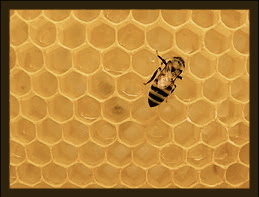 The photo of the bee on the honeycomb. Hi Matthew—done. Thanks so much for the great photo!